Paestum is a small town on the Gulf of Salerno. Its railway station is located close to the temples, but there isn’t a real center of the town, since Paestum is simply an archaeological area belonging to the municipality of Capaccio. This said, one can understand why many foreign tourists know little or nothing about it. However it is purely a cultural gap, as the three best preserved Greek temples in the world lie there next to each other. The fact that these three temples were built here clearly demonstrates that Paestum was an important trade center and cultural exchange since its origins ((550-450 BC) , thanks to its strategic location, near the mouth of the Sele River in the Gulf of Salerno. Of course, the temples are a first class tourist attraction. Even the German poet Goethe visited them in March 1787 just three decades after they were rediscovered and was then strongly impressed. 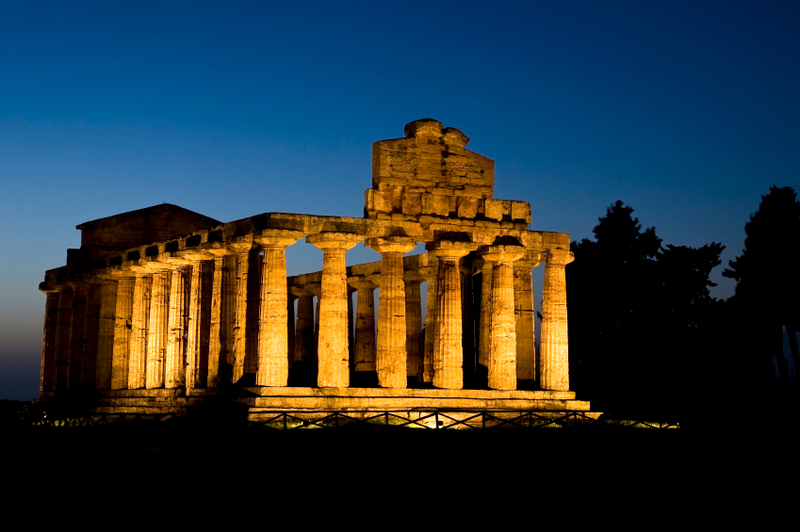 Besides the temples, Paestum has a lot more to offer. Many open-air events take place there during the high season in the summer.